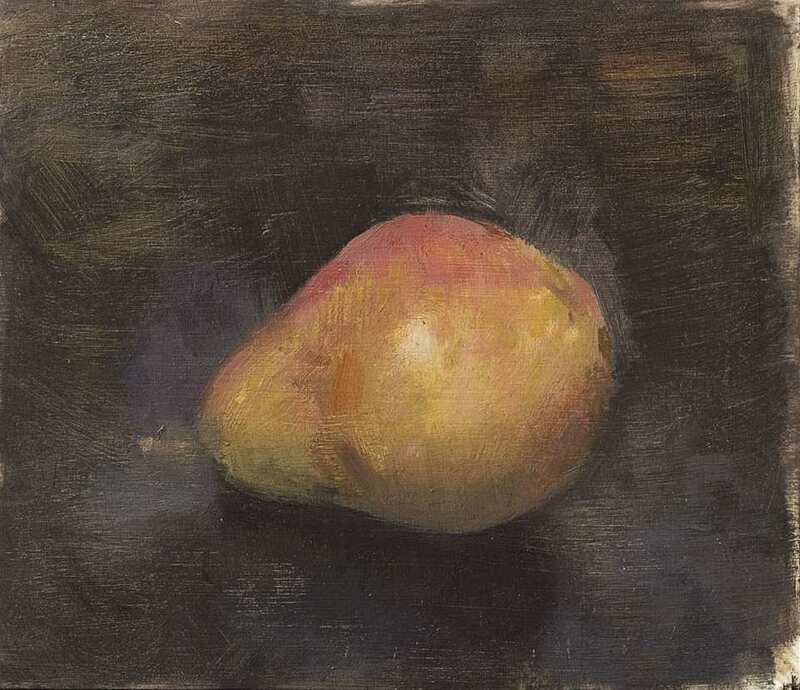 Red Bartlett Pear Oil on board, 6 x 7 in. A job where you paint all day, travel whenever you want and are adored by thousands of fans. And you can even make a little money at it too. What a completely idyllic lifestyle. It almost doesn't seem fair to everyone else. Well then, how about it? Are you fed up with the 9 to 5 routine? Ready to ditch the madness for a life of creativity and freedom? Painting full-time IS a job. A challenging, satisfying, personally rewarding job. Professional painters wouldn't trade it for anything. But still a job. With no guarantee of success and less freedom than you'd expect. A job with many of the frustrations, disappointments, and occasional heartaches that jobs have. – Few collectors have great eyes for art. They're busy, distracted people who can be blind to the greatest talents. – Small and mid-size galleries are in an unprecedented fight for survival, leaving them more reluctant than ever to take on new artists. For the first time in decades, more galleries close each year than open. – Commercial portraiture is tougher still. The 19th century is long gone, and few people are willing to sit for their portrait anymore. Yet portrait clients still expect to radiate life on canvas. – This is an exceptionally lonely vocation. You're working by yourself most of the time, with no lunch meetings, no coworker support, and little meaningful feedback. is that at times one must live alone, or feel alone. Case in point: the words you're reading right now. In 2012, I took up blogging as an enjoyable pastime. Writing what I felt like and when I felt like it. In 2017, blogging became a job. Which means writing every day, same time each day, no matter what the mood. Covering topics that interest readers first and myself second, and trashing most of the drafts. Still enjoyable, but it can also be a grind sometimes. Painting is the same way. It's a wonderful activity that can deepen you while removing stress from your life. But an unpredictable career path that will bring a new dimension of stress into your life. The internal and external pressure to produce, exhibit and sell, continually, can be exhausting. It won't necessarily make you a better artist. Because the market will either push or tempt you to repeat your successes, which can cause you to go stale, mighty fast. Let's focus on just two approaches you can take with your output. The First Approach is to crank out a bunch of nice-looking, affordable works of art that will beautify people's homes. It's a perfectly sensible approach that some artists do very well with. Except there are countless artists all over the world doing the same thing. Emerging artists from developing countries are practically giving their stuff away. Competing with that particular crowd will be tough. Your images start going viral. Collectors start coming after you, some of them actually fighting over your pieces. Contemporary master Ran Ortner (pictured above) can't meet the demand for his work, simply because nobody paints like him. Some of my favorite strategies for taking your skills to the next level can be found in the post 5 Unusual Habits to Keep You Growing Artistically (particularly habit #2). Whoa. The whole point in becoming a painter is to quit my boring, dead-end job. Why would I want to find another boring, dead-end job? Because this is an expensive habit. You'll need a studio, supplies, equipment, frames, possibly storage, and more. Fine if you have a financial cushion, but there's still no telling when your art will support itself, let alone you. The good news is that work that you enjoy can actually fuel your creativity while paying the bills. Teaching and gallery work are the obvious choices. I've also known career artists who loved their side-gigs as personal trainers, interior designers, even farmhands. Take a lesson from our cousins in the acting profession. They audition all day then, do what it takes to keep it going. Collectors ask questions, and they expect meaningful answers. It's their way of assessing you. If you respond with a bunch of hemming and hawing, you'll lose their confidence. One of my favorite painters knows everything about everything: art history, conservation, architecture, the molecular structure of paints and solvents, you name it. And he's one of those guys you just hate sometimes. Because he's a walking encyclopedia and supremely talented. So it's no surprise he's got a mile-long waiting list for his works that sell well into the six figures. Funny thing about human nature is how we can get tired of anything—that dream career, that dream home, that dream relationship (Oh, you again). Drinking Margaritas on the beach all day sounds like fun, but do it every day and even that can get old. I'm not trying to discourage anyone. You could be a smashing success right out of the gate, as some artists are. The starving artist archetype lives mostly in the minds of people who've never actually known one. The truth is that some of the savviest businesspeople around are painters, sculptors, or photographers. Just know that the carefree, stress-free, life of creative expression is a myth. Some internet marketers will tempt you with such a life so they can get your money and quit their jobs. And it's that nothing else makes you feel more alive. Not traveling, not hanging out with friends, not making lots of money. You'll probably have to cut back on those very things for a while. But if the feel of a paintbrush in your hand sets you on fire, if you'd rather be at the easel than anywhere else in the world, then yes, you should seriously consider making this your life. Because creating art is noble. You'll bring inspiration to the world. You'll learn and grow all the time. You'll be thought of as special. Because you are. There are some definite challenges to this life. Chances are you'll be tempted to quit, and probably more than once. But if you manage to stay with it, the challenges will be worth the satisfaction in knowing you had the courage to pursue your passion, and the resourcefulness to make it work. Have you got any tips on becoming “frighteningly” good? Yes, have a look at this post that offers some practical tips. Pay special attention to the “Do the Impossible” tip. Also, try to work every day, same time each day so that it becomes a habit. 20 hours a week, minimum. I’ll probably add these tips to the post very soon. Not remembering where I found your art and now your blog . . . but then again at 74 I only remember what is important for survival . . . which is basically what your post is about and applies to most of life. I remember my parents giving me the “starving artist” lecture and consequently only periodically dabbled in art. I really never drew, painted, until retirement at 70. Art, now, is learning another way to understand and experience the world I see – literally, figuratively (pun intended) and creatively. Thank you for helping me reflect and focus on my “why” rather than the “how”. You could have written this for me, Chris. I always find your thoughts to be insightful and accurate. I quit my job about a month ago, knowingly setting myself up for some stressful days. I’m working my way through and continue to focus on building skills and doing the best work that I can. But it’s not without challenges, as you mentioned. Thanks for keeping it real, as you always do. I wish I could take credit as a mind-reader, but no. And I wish you all the best, Tracy, on your journey. It’s tough but wonderful, and you’ll be great! !